Day 3 in Hong Kong was quiet. Peaceful even. There was a light drizzle outside. We woke up earlier to have our breakfast. Alex told me that the Typhoon Level went up to 10, the highest level and we actually slept through it. I do recall that I could hear the rains beating against the windows the night before but never expected it to be that major. We turned on the news and watched the reports on the typhoon. People actually still went out just to experience a Level 10. But they also showed smaller trees being uprouted, especially at the coastal areas. Before we headed out, the Typhoon Level was still at 8 but it looked so calm, we decided to venture out. 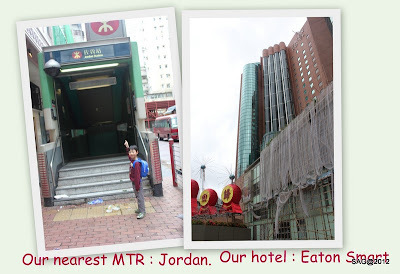 As we exited our hotel, it was really quiet as no one was going to work due to the typhoon. Most of the stores remained closed. 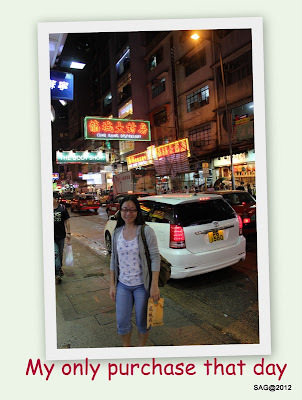 We continued to walk ahead towards the direction of Fa Yuen Street. Along the way, luckily we found a quaint looking place that served breakfast. 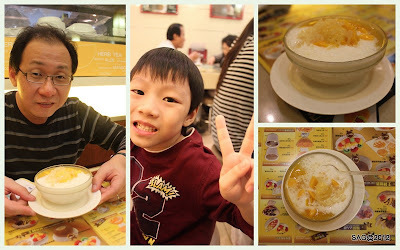 We ordered Chee Cheong Fun, Fish Porridge, You Tiao and Soya Bean Milk. I tell you it was really the most simplest yet yummiest breakfast in the longest time. The porridge was so smooth and it just glided down the throat so easily. The fish was fresh too. Ahhh... the simple pleasures in life. After our breakfast, we decided to continue on. The streets were so quiet and almost deserted. Lying around were lots of broken umbrellas and their metal sticks, remnants of Typhoon Vincente. As we reached Fa Yuen Street, the city seems to be more alive; with the shop and push-cart owners slowly unpacking their wares and setting up their stalls. The most interesting sight for Baby G was the Goldfish Street. Quite a number of shops were already opened and the various varieties of fishes were put up on display. Baby G was very enthralled by the sights and sounds... and not to mention, the many questions he had for us. Along the way, we stopped by for some snacks. 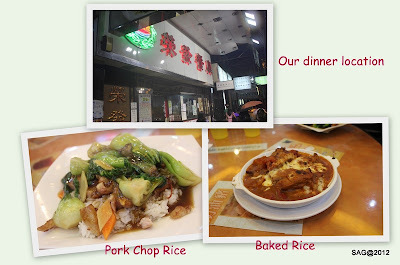 In Hong Kong, must eat 鱼蛋, so we tried the non-spicy one foor Baby G. We also ordered carrot cake. I must say, it was quite refreshing fishball and carrot cake, not that oily, in fact. 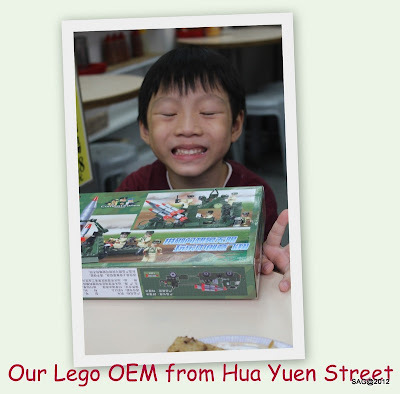 And Baby G was really happy with his OEM Lego purchase of the Army Tank. After our short snack break, we continued on along the streets. As the majority of the Hong Kong residents were still at home due to the typhoon, not many stalls were opened. 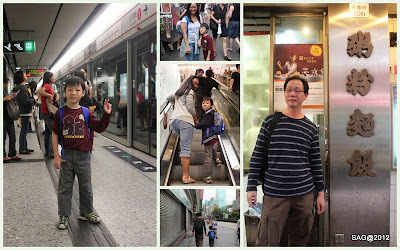 We simply strolled along the streets, taking in the sights and sounds that Hong Kong has to offer. Along the way, we found a stall selling egg tarts, amongst other pastries. 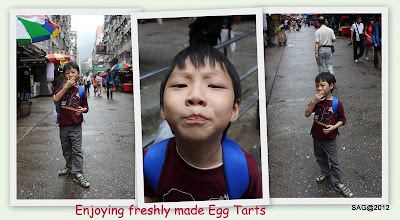 The smell was so tempting that we just had to stop and buy some egg tarts to munch, even though we just had our snacks. Baby G loved the egg tarts and gobbled them down. 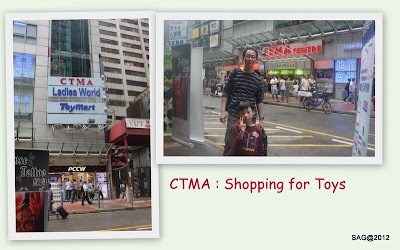 Our next stop was CTMA, another centre that sold various toys & figurines. As we walked in, it reminded me of the old styled buildings like Queensway where the shops were small and quite cramped up. We found a shop selling Lego again, but the prices were much more expensive than what was advised to us by our friends so we just skipped that. However, I did see a Lego Star Wars series of the Death Star retailing at HKD4499. Tempting but the words 'budget.. budget.... budget' came to my mind. Perhaps next time round. Lunch was at Fek Kee Congee recommended by OpenRice website. 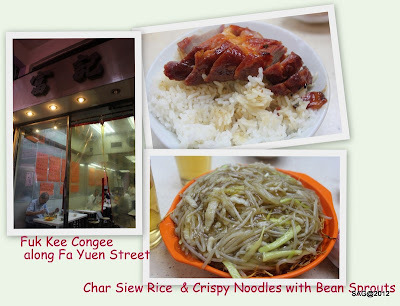 We ordered porridge, Char Siew rice and Cripsy Noodles with Lean Pork. The Char Siew and the porridge arrived together and both Baby G and Alex enjoyed their food. My noodles came much later and when it came, I almost fell off the chair. The entire noodles was covered with bean sprouts! I was trying to find the lean pork and lo and behold, there were a few pieces under the mountain of bean sprouts. I looked at Alex, hoping to appeal to him to eat but he shook his head and told me he's pretty full from the rice. Baby G was teasing me about the bean sprouts. 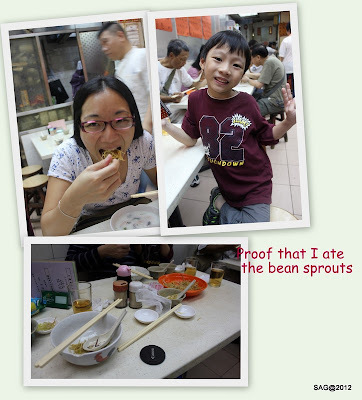 In the end, in order to set a good example to Baby G not to waste food, I actually ate the bean sprouts. I must say, this is one lunch that I truly did not enjoy but to be fair, the noodles was nice. In the end, Alex took pity on me and helped me to eat a portion of the bean sprouts; Baby G also helping out a little. In the end, we managed to finish quite a fair bit but only leaving a portion when I really couldn't swallow any more. Finally, the moment that Baby G has waited for. In's Point where his Lego awaits. 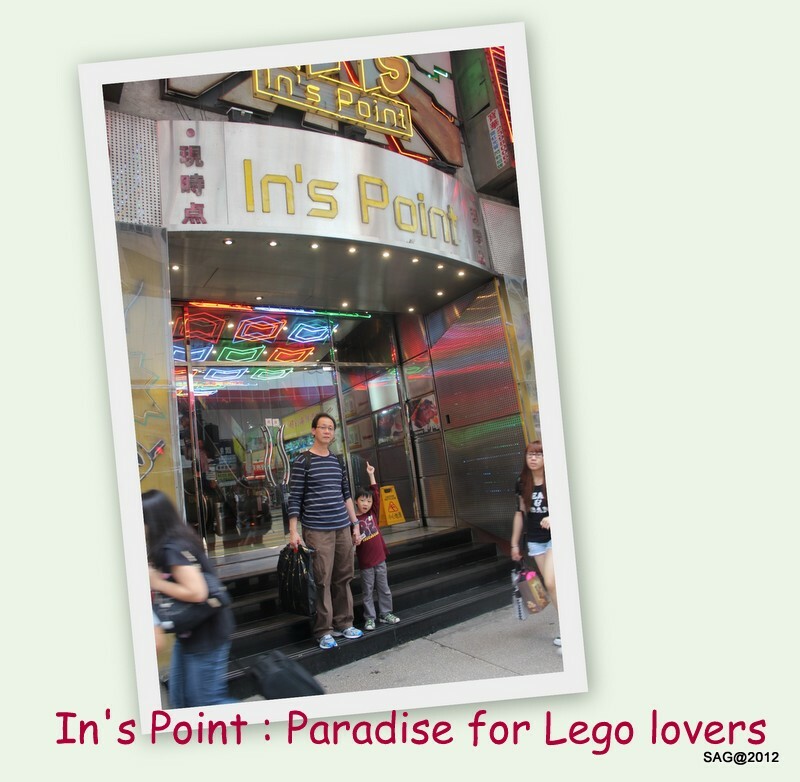 The shop recommended to us by Dan was #166 and #168 but the shops were closed. Baby G was so disappointed. 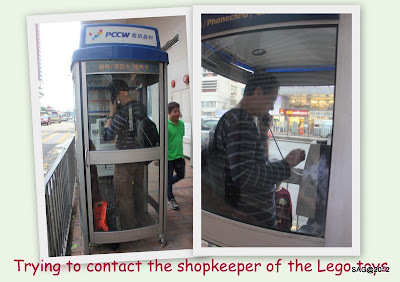 We even found a public telephone to call the owner to ask if he was planning to open his shop for that day but no one answered. In the end, we went back in and looked at other shops. Luckily, we found another shop, #175, also selling some items at a reasonable price. We bought one set from them but we decided that we will make a trip back again another day. Baby G was happy with the purchase. Another short break for us to rest our tired legs. Mango and Sago desserts. Baby G all in smiles due to his Lego. 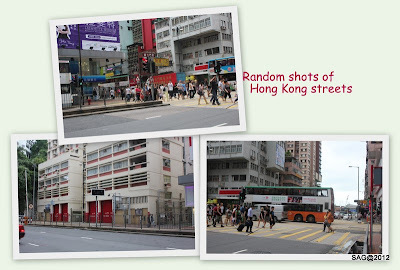 Here are some of the random pictures we took of Hong Kong streets when the weather started to clear up. As evening approached, the rains also started to fall. 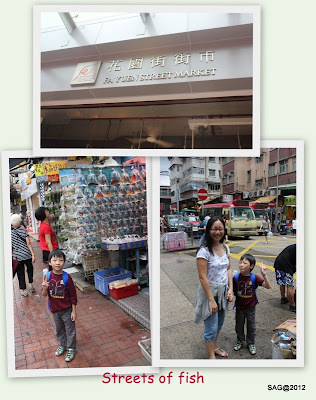 We dropped by the Lung Shing Dispensary, famous for their reasonably-priced toiletries and cosmetics. Too bad, my SK-II Essence was out of stock, in the end, just got an Olay range of cream for myself. At least, I did not come out empty-handed. As we walked on, the rains started to get heavier and heavier and we decided to make a pit-stop for dinner. We found this stall along the way that had baked rice which Baby G said he wanted. This time, I decided not to order my share, just in case Baby G couldn't finish his meal as baked rice in the pictures looked like it was a large portion. Alex ordered the Pork Chop rice for himself. When we finished our dinner, the rains came again. It was wet and cold. We walked in the rain, back to our hotel to dry up and have a rest. Not much mood for any more shopping or sight-seeing so we decided to remain in our room to enjoy the free wi-fi and Baby G enjoying his 'Puppy in My Pocket' cartoon. Another set of random pictures of Day 3 in Hong Kong, when the weather was much clearer.